Our guest researcher Benjamin Steininger published an article, “Pipeline. Am Puls der fossilen Moderne”, in the book “Stoffe in Bewegung. 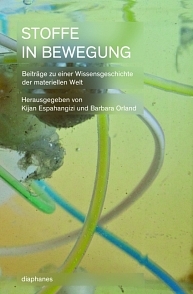 Beiträge zu einer Wissensgeschichte der materiellen Welt.” (by Kijan Malte Espahangizi and Barbara Orland (editors)), with a cover photo of one of our prototypes, taken in the studio of LIQUID THINGS.